What variety on of Tomatos are you planting this year? Will you grow from seed or will you buy young plants? I like 'Early Girls' when I buy the young plants. do you have a deck? if so, you can plant a tomato in a pot. Thanks! I'm really lucky though and have a good sized garden. My unfortunate bit is a short, cool growing season. Actually, my comment about the pot was aimed at Phlamingho. I have several gardens, each with a different purpose. The tomatos go in the biggest garden - the vegetable one. I'm planting a mix, hopefully from seed. I have several started already, but it will be weeks yet before I can move them outside (we still have freezing weather right now). What can I say, I have spring fever really bad, and hubby suggested I go ahead and start some seeds. Even if they don't make it, I'll be happy. I sometimes don't have much luck with starting from seed. Last year I planted twice, only to have a late frost kill the seedlings. So, I ended up buying plants. I'm planting a mix. One cherry like 'baby girl' because the kids love eating these right off the plant. One beef like 'big boy' because these are great sliced and in salads. And a bunch of paste like 'romas' because these store so well. I've found that one plant, once it gets going produces more than enough tomatos to keep me going while they are fresh. The pastes are best for storing, though because they have more flesh and less seeds. They make great sauces and salsa and stew wonderfully. My youngest kid really likes 'tomato chips', and only paste tomatos dry well. Tomato chips, what a great idea! I will be in CA this summer and my mom will have a huge surplus of toms. I will have to try and make some! Thank you for selecting me. :D Yes, the tomato chips thing was something I tried for the first time last year. Someone had given me a dehydrator, and I read somewhere that dried tomatos stored very well and were considered something of a delicacy by some. So, I tried it. I used the various tomatos I had. The problem with the beef tomatos is that they are much juicier than the paste. You dry them and not much is left. The paste did much better. I didn't get to test how well they stored, though. My youngest, who hates vegetables in general, found the bag and ate them all. I couldn't be angry. I was so thrilled he was eating a vegetable. You may be sure, I'll be drying a bunch this year. I plan on planting early girls and big boys. I like both of them. I plant them from plants and not seeds. I won't plant pear tomatoes because I just think they're shape is too weird...lol Here's a pic of some caterpillars hanging out on my tomato plants. Are the pear tomatos the yellow ones? I will have to remind my mom about them this year. I will be in her garden this summer, so I will have to go along with her choices, but I may get a couple of 1 gallons after I arrive and stick them in a bare spot. This year I am living in an appartment.So I will favour small plants rather than seeds.It is easy for my pots in the balcony.This year I will like to grow plum tomatoes, cucumbers,beans,lettuce .I will also like to grow flowers like daisy, rose etc.Young plants are my favour as it is easy to grow. Wow, that's quite a list for an apartment deck. You do know that cucumbers get pretty big? My lettuce last year got huge, but then I probably didn't trim them like I should have. Well i always grow my own fruit and vegables but all i get is the cheapest ones that are there! Lidl has all their seeds out, and there are cheapies in Supervalu, too. 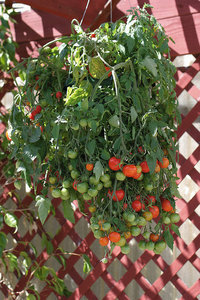 I plant tumbling tom's every year, these grow out of a hanging basket, and they look and taste great. I think they are dwarf or cherry sized tomatoes, aren't they? I had a slew of seeedlings last year and they all got that damping off and not a one survived. I'd like to try them again though because they would be ideal for the patio. I love growing tomatoes if we can keep the neighbors chickens out of them they are always being let loose to rome and they head straight for our cucumbers and tomatoes. We like to plant little tommy toes(cherry tomatoes), roma tomatoes and beefsteak, a few early girls, And sometimes a low acid yellow. Before we moved to where we live now I used to can 10 dozen pint jars of tomatoes a year. Now we just have a small plot in which to grow enough to be able to enjoy a few of our favorites while they last. I know to grow from seeds is cheaper, but we usually buy the plants because it seems they grow better and bear more tomatoes then we try to grow them from seeds. Maybe it is the fertilizer I don't know. But good luck and happy eating!.. Funny you should mention chickens... I have my own flock. People ask me if the fence around my garden is to keep out the rabbits. I always say it is mostly to keep out the chickens. Easy fence, just two feet high, not permanent. For that matter, we dismantle the whole thing in the spring when we till, then put it back up. It doubles as a trellis for the peas. forgive my silliness...i have never seen a seed before.and i dont know there are so many types of tomatos.Early Girls?does that mean small tomatos?i just know the fruit,it's red,and can be cooked as a vegetable,:)i dont know other things about tomato. you have gave me some knowledge,thanks. Oh yeah, there are several kinds. They have different textures, flavors, shapes and sizes. The three basic types are the beef (eg. big boy), the paste (eg. roma and early girl), and the cherry (baby girl). The large round ones are basicly beef. They are juicy and are best eaten fresh. The paste tomato is the best for cooking and storing. They aren't nearly as juicy. You get more "meat". Personally, I also like the taste fresh, but that isn't their greatest strength. Finally, the cherries. These are the little ones. As the name implies, they are the size of cherries. I actually prefer the ones that are called "grape" tomatos. They are a sweet variety of cherry tomato. Very tasty and my kids love them.